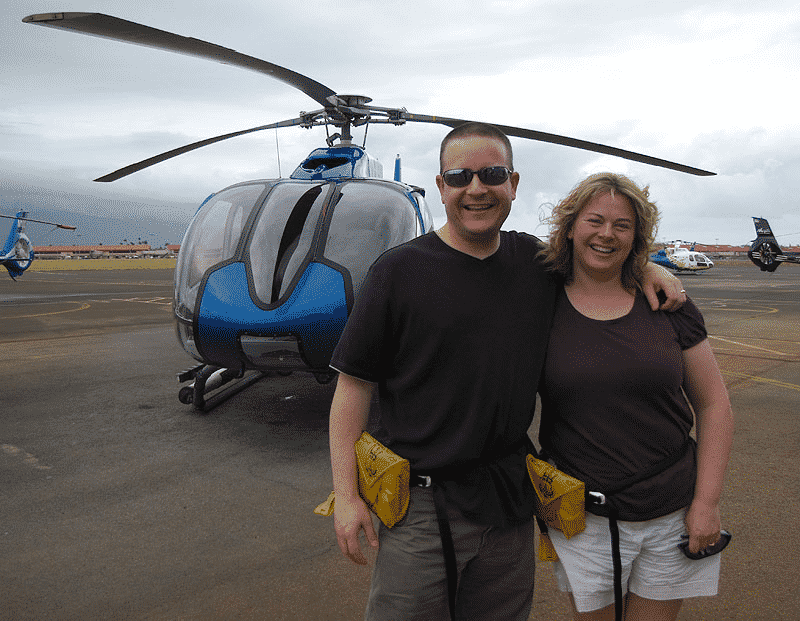 Matt & Cari prepare for a Maui helicopter tour. First-time Hawaii visitors Matt and Cari from Tri-Cities, Washington thoroughly researched their May trip through their Hawaii vacation planning resources. While they were well prepared for their Maui vacation, they were still surprised by several aspects of Hawaii. I always like to read and hear what first time Hawaii visitors think of their trip to the Aloha State. So when Matt and Cari offered to write this guest post to describe what they found surprising about Hawaii, I was all for it! I think you will enjoy reading Matt and Cari’s Hawaii surprises. I knew it would be hot, but for some reason I never thought about how humid it would be. It hits you like a brick wall when you get off the airplane. Of course, it’s a tropical island so, in hindsight it makes perfect sense. I just never thought about it in advance. And not just humidity, but it also rained a lot during our visit — much more than I expected. I think I had this Chamber of Commerce vision of perfectly clear, blue skies that stretch on and on. This isn’t a complaint; the weather didn’t stop us from a wonderful visit. It just wasn’t what I expected. We read plenty of articles that mentioned things are more expensive in Hawaii, but there’s still a sense of sticker-shock when you pull into the gas station and fill up at $5.15 per gallon. Or when you go to Kmart for some snacks and basics, put about 10-12 items in your cart and the cashier says, “That’ll be $99.90.” It may have been something I tried to not believe, but there was no avoiding it on the island. I had no idea how much I would LOVE snorkeling and snuba. We took the Four Winds II boat out to Molokini on our first day there and I didn’t want to get out of the water! I even told Cari that I’d be happy to cancel all of our other plans for the rest of the week and come back and do the same boat ride each day. After a couple minutes of struggling with the snuba gear, it was a thrill to go down 10-15 feet below the surface and get up close to all kinds of fish, plus to see the amazing coral on the ocean floor. Man, I’m ready to go back now and do it again! No matter how many pictures you look at, you won’t be prepared for the Maui’s stunning beauty. The ocean? I had no idea there were so many shades of blue! The land? You’ll see every shade of green possible along the road to Hana. And when the two come together, like at the Ke’anea peninsula or the end of Nahiku Road – there are no words. Black sand beaches? Red sand beaches? Sigh. It’s more beautiful than I could’ve expected. I’m a reader. I have a bachelor’s degree in English Literature. I have read through countless books, articles, essays and cereal box backs. I thought I knew how to use language to share my feelings, and how others use words to express themselves. But that was before I visited Hawaii! In Hawaii, one simple word connotes welcome and consideration and hospitality – and that word is ‘aloha’. Yes, I know it’s not an English word, so I suppose I couldn’t be expected to truly understand the many layers of meaning another language infuses into its words. However, it was still a surprise to me since I thought I knew what it meant – “hello”, or “goodbye”. However, it was the way the word was spoken on Maui that helped me see that there was a difference…subtle, yet distinct. The Hawaiians I met conveyed empathy and kindness and understated joy in those five letters, and I felt like shafts of sunlight were slanting from their mouth when they said it. When my husband and I went on our honeymoon, we went to San Diego, CA, and loved everything we ate there. Everything from Sea World’s hot dogs to McDonald’s milkshakes were elevated to sublime! In retrospect, it wasn’t because the food was so spectacular, it was because we were on our honeymoon! However, even though I was in Hawaii, again with my husband, nearly twenty years have passed (as has his capacity to turn fish and chips into lobster in my mind!). So I can say with certainty, the food really was excellent. Truly, anyone would agree – especially when it came to the pineapple and the shave ice. Oh my gosh – this ain’t your mother’s snowcone! And that’s exactly how I felt about Hawaii. We saw so many gorgeous vistas all over Maui, that by our third day there, it was, “Oh. Pretty.” over and over again, because I’d become surfeit with gorgeous things! That being said, it was stunningly beautiful, and pictures help, but there is no substitute for seeing it in person. It is truly awe-inspiring. A big mahalo to Matt and Cari for sharing their Hawaii surprises! It’s absolutely true about how beautiful it is in Maui. I’ve said the exact same things to everyone. The pictures you take are really nice, but they can in NO WAY capture how stunningly gorgeous it is in person. It’s breathtaking. I LOVED reading this! There’s nothing like those first reactions we have to a new place. It’s fun to see Hawaii through newbies’ eyes.